There are almost 200 official countries in the world but there are dozens more unrecognised nations determined to be independent. They have rulers, parliaments and armies, but they rarely feature on maps and receive few foreign visitors. Somaliland's government minister for tourism was elated that he finally had a rare foreign visitor he could take to see his country's national treasures. "Don't worry," said the enthusiastic minister, as I reluctantly agreed to accompany him to some rock etchings recently discovered at Laas Ga'al outside Hargeisa, the capital of Somaliland. "The drawings are beautiful, and it will just be a small detour from the road!" As we bumped along potholed dirt tracks through the parched African bush, I started to think my scepticism was justified. But we dodged wiry bushes on a wide plain and scrambled over vast boulders to find exquisite rock paintings dating back thousands of years. Even under the scorching sun, the paintings had strong, vibrant colours and stark outlines, showing the ancient inhabitants of the area worshipping cattle. 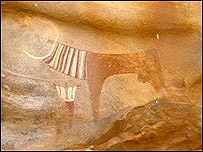 Laas Ga'al, it transpires, is probably the most significant Neolithic rock painting site in the whole of Africa. For a brief moment I felt like an explorer finding hidden treasures, at a time when the entire world seems within easy reach. But there are still places off the beaten track, like Somaliland, which can excite and amaze. Somaliland is not on many tourist maps. In fact, it is not on any maps at all. According to the international community, Somaliland does not even exist. Across the globe there are dozens of unrecognised countries, and I embarked on a journey to a group of them who declared independence after conflicts with a neighbouring state. In the case of Somaliland, that is Somalia and with a BBC film crew I began several months of travel by flying into a dusty airstrip just outside Mogadishu, the Somali capital. Years of fighting have destroyed once-beautiful Mogadishu. Abandoned by the international community, it is among the most dangerous cities in the world. After paying a dozen guards to provide protection, I went to the main market and bought myself a Somali passport from a gentleman called Mr Big Beard. Although Somalia has no police or real government, the rest of the world recognises it as an official country. By contrast Somaliland, in the north of Somalia, has a government, police, army and traffic lights, but no recognition, making it extremely difficult for the country to attract aid and investment. A UN cargo flight took us north to Somaliland, and a smartly dressed Somaliland immigration official stamped our passports when we landed. His presence and uniform was an immediate sign of order. Britain is the former colonial power in Somaliland, and Somalilanders fought alongside British troops during World War II. They struggle to understand why the UK has not recognised their country. Yusuf Abdi Gabobe, my towering local guide, explained that Somaliland voluntarily joined with Somalia after independence from Britain. But when the relationship soured, Somalilanders fought a war for complete independence in the 1980s. Visiting Somaliland was a humbling lesson in survival and self-determination. Hargeisa, where 50,000 died during the conflict, is being rebuilt with little outside help, and refugees are returning from camps in Ethiopia. A Somali MiG jet that bombed the city sits atop a poignant war memorial. Outside Hargeisa there were the ancient rock paintings to visit, and stunning journeys into the mountains and up to the port of Berbera, home to a runway hired by Nasa as an emergency space shuttle landing strip. Tracks run along the coast west from Berbera towards Djibouti, and mangroves, gorgeous islands and coral reef. But Somaliland's main attraction is its determined and inspirational people. Largely ignored by the world, they are building an independent state from scratch. Many fear war between Somalia and Somaliland could erupt again, but perhaps one day the people of the Horn of Africa will have the peace and security they desperately want, and foreign visitors will start to return. It is nothing less than Somalilanders and Somalis deserve. 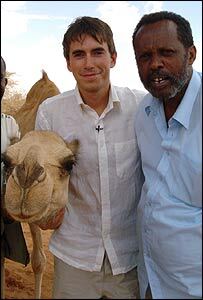 Places That Don't Exist: Somaliland was broadcast on Wednesday 4 May, 2005 at 1930 BST on BBC Two. The series continues every week until Wednesday 1 June, 2005. Next week: Transdniestria.